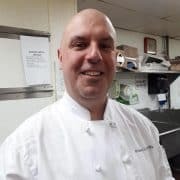 Born and raised in Vancouver, Jason has been working at the pinnacle hotel for 20 years, previously the Renaissance hotel, Jason is the chef de partie and assists in the banquets structure of the hotel, assisting in groups of up to 1200. His passions and talents are in Mexican and Italian cooking. and has worked from the tomahawk grill to diva at the met.